Black and white Bollywood poster of the hit Hindi film Haqeeqat (1964) for sale. This is an actual surviving black and white Bollywood poster of the award winning 1964 war film Haqeeqat which starred Balraj Sahni, Dharmendra and Vijay Anand in lead roles. Printed and circulated several years after the original first release of the film (somewhere in the 1990s), this old black and white Bollywood poster was printed for publicity of a subsequent release of the film but never ended up being used. Directed by Chetan Anand, Haqeeqat was a war film based on the 1962 Sino-Indian war. It won the National Film Award for second best feature film in 1965, making this old black and white Bollywood poster, highly collectible! 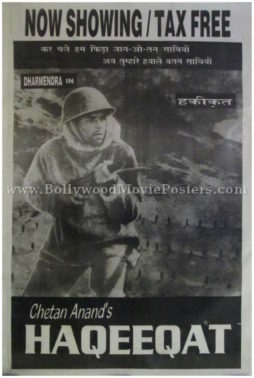 This Dharmendra movie poster features a black and white still photo of the superstar dressed in combat gear. A war scene is shown in the background. The film’s nationalist and patriotic theme earned it a tax free status which is duly advertised on the top of this old black and white Bollywood poster. A song from Haqeeqat, “Kar Chale Hum Fida Jaan O Tan Sathiyo; Ab Tumhare Hawale Watan Sathiyon …” sung by Mohammed Rafi has become virtually synonymous with patriotism in India. This old black and white Bollywood poster capitalizes on the tremendous success of the song by mentioning its lyrics on the top in Devanagari Hindi font. Old Bollywood poster of the hit Hindi film Haqeeqat (1964) for sale. 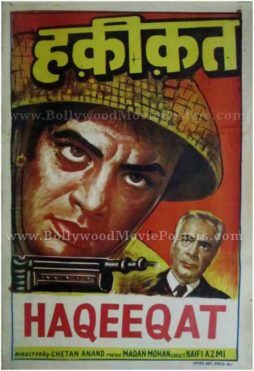 This is an actual surviving old Hindi movie poster of the award winning 1964 war film Haqeeqat which starred Balraj Sahni, Dharmendra and Vijay Anand in lead roles. Printed and circulated a few years after the original first release of the film (somewhere in the late 1960s), this vintage Bollywood poster was printed for publicity of the film but never ended up being used. Directed by Chetan Anand, Haqeeqat was a war film based on the 1962 Sino-Indian war. It won the National Film Award for second best feature film in 1965, making this vintage Bollywood poster, highly collectible! This vintage Bollywood poster was originally designed in hand painted oil on canvas format by a small time art studio in Delhi, giving it a quirky appearance. The poster features a large hand painted close up portrait of Dharmendra wearing a combat helmet and holding a machine gun. The background has been painted using a combination of red and yellow, giving this vintage Bollywood poster a very catchy appearance. Title of the film is seen in yellow on the top and again in red at the bottom, prominently set against a white background. A smaller portrait of Balraj Sahni is seen at the bottom right hand corner.